Nothing spells better wishes than An orchard-fresh pack of freshly picked fruits presented with cheery Gerberas flowers and a "Get Well Soon" 9" foil air balloon. At least 5 types of hand-picked varieties of juicy fruits to be savoured. As only the freshest fruits and flowers are used for all our fruit arrangements, the types of fruits and seasonal flowers may be subjected to change. 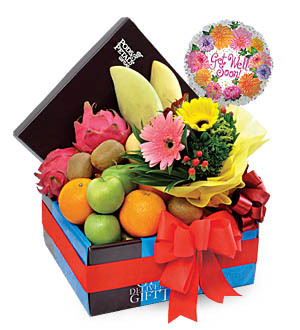 Fruits Gift are ideal as a Get Well Gift, for new Mother, "You're welcome" or as a 'Thank You' Gift. Balloon Message can be changed to "Smiley", "Thank You", "Congrats" or "It's Your Day".